Our primary interest is in understanding the molecular and cellular basis of disease resistance in plants. Plants are able to specifically recognize pathogens and actively respond. We are investigating how this specific recognition is accomplished and how recognition is translated into a resistant response. To address these questions we take a molecular genetic approach. We use the small mustard Arabidopsis thaliana as our standard host plant, and both fungal (powdery mildew) and bacterial pathogens ( Pseudomonas syringae) as our standard pathogens. Recognition of specific P. syringae strains by Arabidopsis is mediated by specific disease resistance (R) genes of Arabidopsis. These R genes encode intracellular receptors that detect a signal produced directly or indirectly by bacterial proteins that are injected into the plant cell. Our laboratory has made significant contributions to our understanding of HOW R proteins mediate pathogen recognition. These insights are now leading to new approaches for engineering disease resistance in plants. For example, we have shown that the R protein RPS5 is activated by proteolytic cleavage of a second host protein PBS1 by proteases secreted by P. syringae. Armed with this knowledge, we are now engineering this system to recognize new pathogens by modifying the protease cleavage site within PBS1 so that it becomes cleavable by proteases from other pathogens, such as viruses. 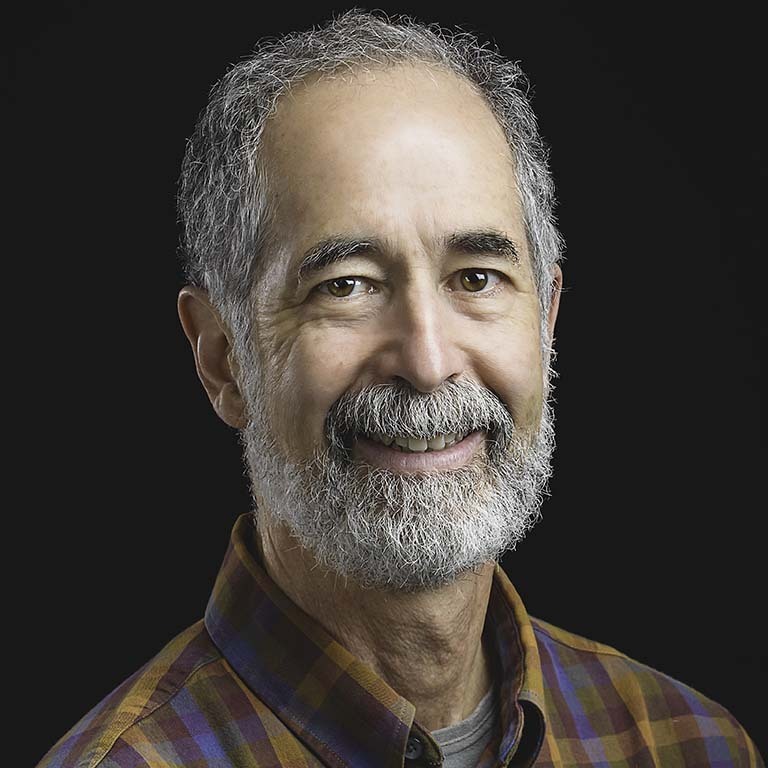 In this manner, we believe we can engineer resistance to a diverse array of pathogens, once we know the proteases employed by these pathogens to cause disease. We are currently applying this discovery to engineer novel disease resistance traits in soybean. In a second project, we have been examining endomembrane trafficking in plant cells in the context of active defense responses. When a plant leaf is colonized by a pathogen, it dramatically increases secretion of antimicrobial compounds. This secretion process is complex and appears to involve non-canonical secretory pathways. Based on electron microscopy analyses, this process includes secretion of vesicles known as exosomes, which are lipid-bilayer spheres ranging in size between 50 and 200 nm. The contents of these vesicles and their function in immunity has not been reported. We have recently determined that they are enriched in defense proteins and carry microRNAs. This latter finding is quite exciting as it suggests plants may employ exosomes for intercellular signaling, and perhaps interkingdom signaling. We hypothesize that exosomes may mediate transfer of silencing RNAs between plants and pathogens, and are now actively testing this hypothesis. Transmission Electron Microscopy image of a fungal infection site inside an Arabidopsis epidermal cell. 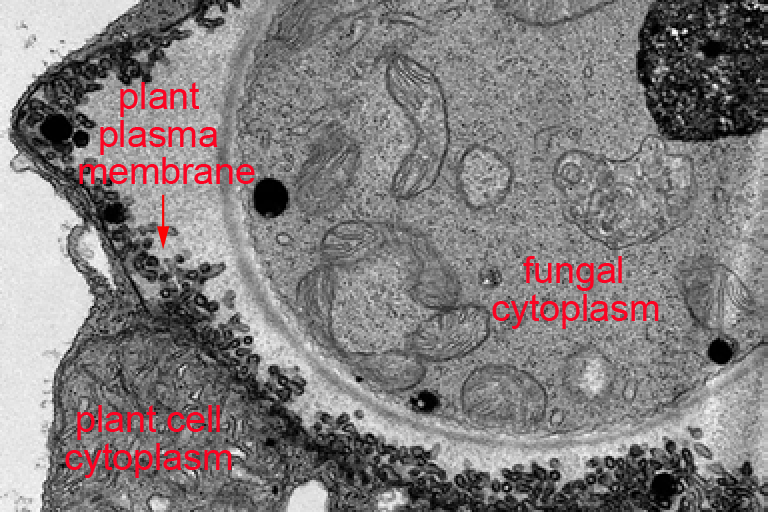 Note the microvilli-like structures formed by the host cell plasma membrane. These structures vastly increase surface area and likely enable rapid exchange of materials between the host cell and fungus (the powdery mildew species Golovinomyces cichoracearum). 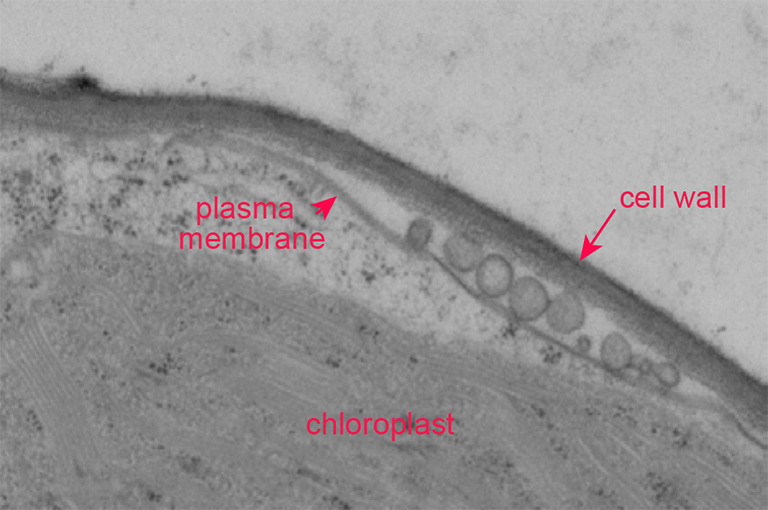 Extracellular vesicles trapped between the cell wall and plasma membrane of an Arabidopsis mesophyll cell. The Innes lab studies the contents and functions of extracellular vesicles. Epidermal pavement cells on the cotyledon of an Arabidopsis seedling. 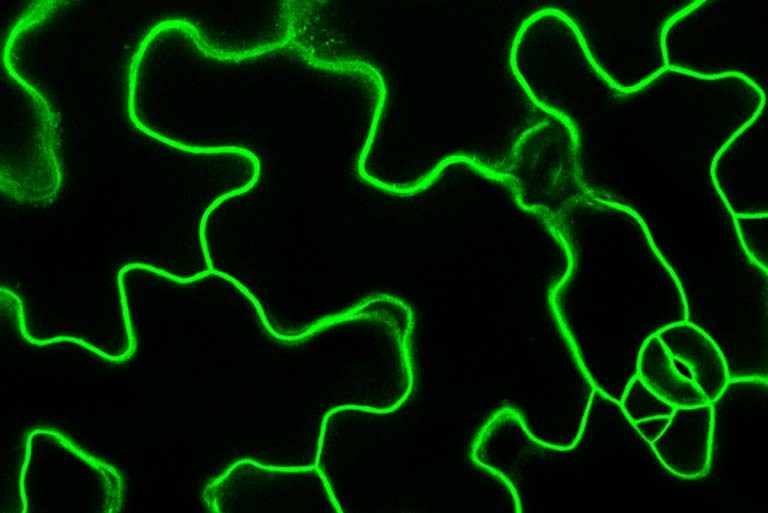 The plasma membrane of these cells fluoresces green due to the expression of jellyfish Green Fluorescent Protein fused to the Arabidopsis plasma membrane protein BRI1. 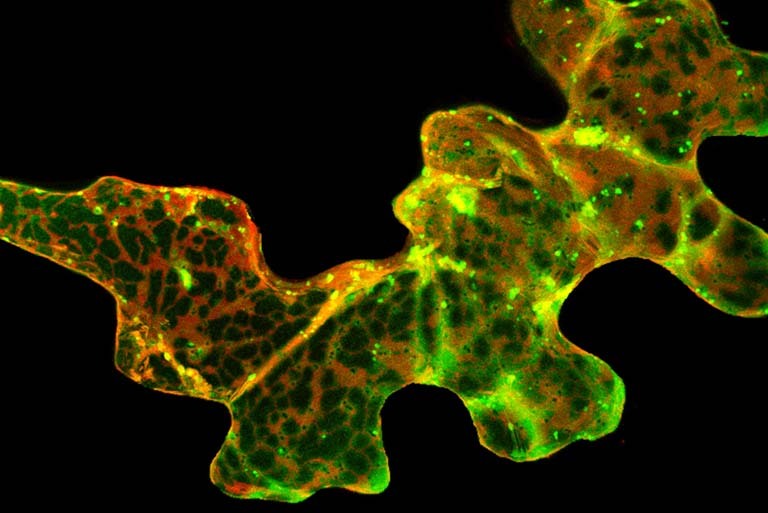 Images such as these enable the Innes lab to study the dynamics of protein localization within plant cells. Localization of the KEEP ON GOING (KEG) protein in an epidermal cell of Nicotiana benthamiana. KEG-GFP (green) was transiently co-expressed with the endoplasmic reticulum marker ER-mCherry (red). Regions of co-localization appear yellow. KEG regulates endomembrane trafficking, including secretion of defense proteins. Ultraviolet light image of two Arabidopsis plants infected with Turnip mosaic virus tagged with GFP. 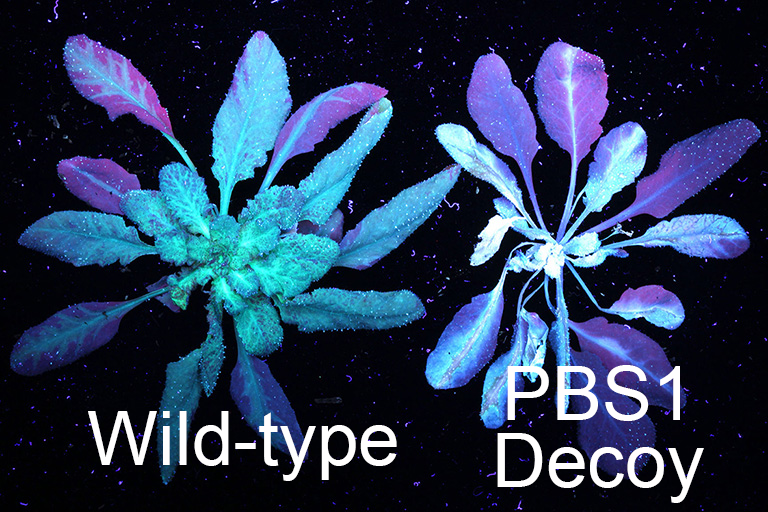 The wild-type plant exhibits systemic infection, while the plant expressing the PBS1 decoy protein shows programmed cell death and no systemic infection. The Innes lab is developing PBS1 decoys that will confer resistance to multiple fungal and viral pathogens.